The primary producing plays in the Denver Basin are the Dakota Group (Combined D and J Sandstones) and the J Sandstone Deep Gas (Wattenberg). Approximately 90 percent of the 800 MMbbl and 1.2 Tcf produced from the basin has been from the J sandstone. Oil was discovered in the Lyons Sandstone in 1953 at Keaton field. The largest fields are Black Hollow and Pierce in Weld County, Colorado, which have each produced more than 10 MMbbl. 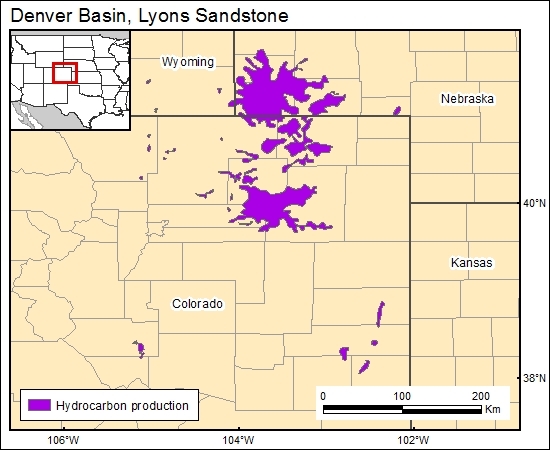 Four fields are located in the Lyons Sandstone-Berthoud, Black Hollow, New Windsor, and Pierce. Average porosity and permeability for fields are about 9 to 12 percent and 21 to 88 md, respectively. Clayton, J., and Swetland, P., 1988, Petroleum generation and migration in Denver Basin: American Association of Petroleum Geologists Bulletin, v. 64, no. 10, p. 1613-1633.